It’s 8.30 on a bright November morning and I’m guessing that I’m the only blogger on the Computer Weekly site up and without a hangover. Last night was the blog awards… but while my colleagues were pouring champagne down each other’s pants, I was tucked up early in bed. Testing an alarm clock. One of the perks of being an International, jet-setting gadget blogger (if occasionally jumping on the Transpennine Express counts as jet-setting) is that you get sent gadgets to try. After blogging about the Lumie Visor the other week, the company kindly sent me an alarm clock to give a go. My reputation clearly precedes me. No ordinary alarm clock, this. It’s a Lumie Bodyclock Advanced 200. Instead of waking you with the bludgeoning tones of Chris Moyles barking inanities into your face, it gently nudges you from slumber with a simulated sunrise. A strong bulb gradually fades up until there’s bright dawn in your bedroom. Perfect for early morning meetings. The advanced version we’ve been testing also has a nightlight feature that fades down when you go night night. If traffic and drunken revellers are a problem in your area, or you suffer from tinnitus, there’s a built in white noise generator that’ll mask any overwhelming background sound. It has all the other bog-standard features you’d expect from an alarm clock too – rude beeping to get you out of bed if the light’s not enough, configurable LED clock and snooze features. I’ve been testing it for over a week – and it’s certainly converted me. You wake up slowly and naturally, rather than sitting bolt upright with drool hanging from your mouth, screaming for your mother. The only issue I had is that I like an extra nudge – and had to set a separate radio alarm to go off in tandem. Lumie also produce a model with an FM radio built in. Last time I checked, analogue radio was resolutely on its way out though. The digital switch over for radio is rumoured to come in 2015 – and a DAB alarm clock can be bought for under £50 these days. 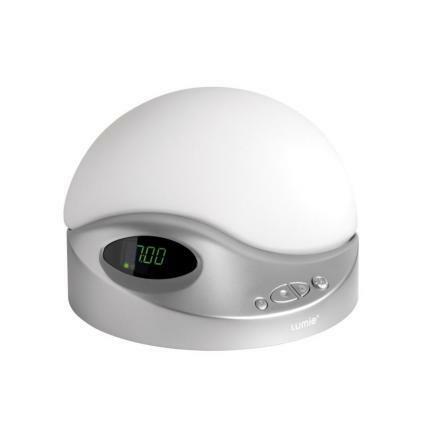 Lumie Bodyclock alarms start at £58.67. The Bodyclock Advanced 200 we tested is £97.82.